Manila, Philippines - Public storm Signal No. 1 was raised over the province of Catanduanes as Typhoon Glenda with international name of Rammasun entered PAR Sunday night, July 13, 2014. 'Bagyong Glenda' maintained its strength as it continues to move in a westward direction. "Public Storm Warning Signal No. 1 with winds of 30-60 kph is expected within the next 36 hours at Catanduanes", weather bureau PAGASA said. 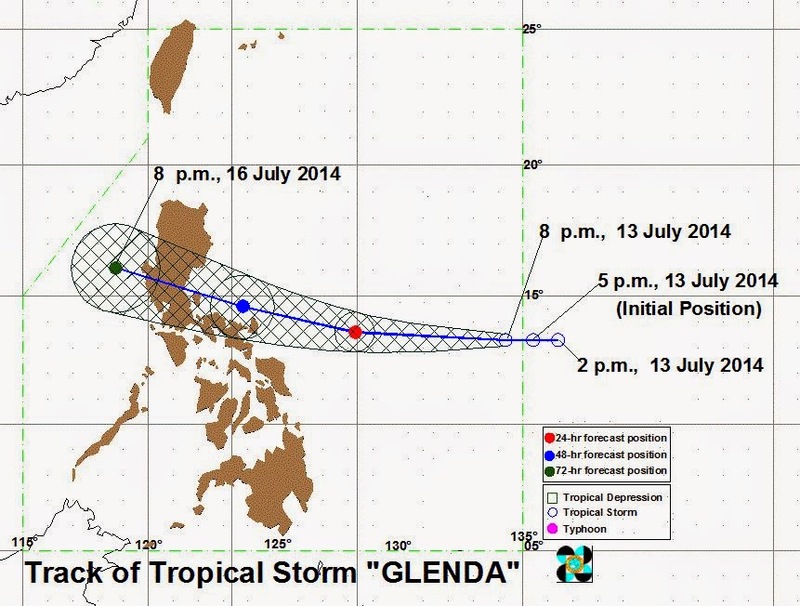 At 10:00 PM today (July 13, 2014), Tropical Storm “GLENDA” was estimated based on all available data at 940 km East of Virac, Catanduanes (13.3°N, 133.9°E). It has a maximum sustained winds of 65 kph near the center and gustiness of up to 80 kph. It is forecast to move West at 30 kph. Typhoon“GLENDA” is expected to be at 400 km East of Virac Catanduanes by tomorrow evening (July 14) and at 80 km Northeast of Daet, Camarines Norte or 190 km East of Infanta, Quezon by Tuesday evening. By Wednesday evening, it is expected to be at 150 km Northwest of Iba, Zambales. PAGASA advised that sea travel is risky over the Eastern seaboards of Luzon and of Visayas.